Hotspot Shield is a free program that allows you to secure your connection while surfing WiFi hotspots and to access sites not normally available outside of the USA, like Huluand Pandora. To secure your internet connection, Hotspot Shield creates a Virtual Private Network (a secure connection, usually abbreviated to VPN) between your computer and the Hotspot Shield developer's website, Anchorfree, based in the USA. This connection makes websites think that you are based in the US. Everything is done in an extra tab open in your browser, so there's no need to configure anything. 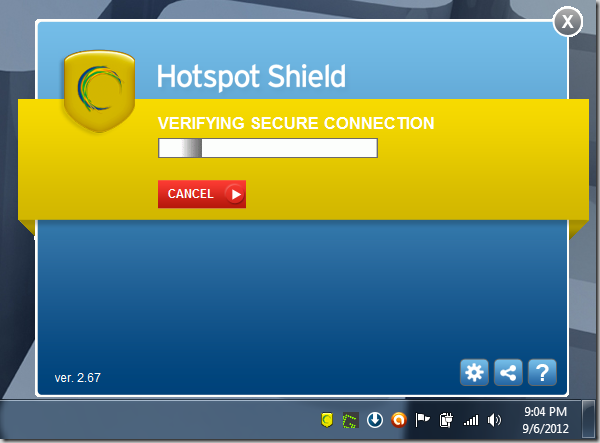 A green and red shield in your system tray indicates when Hotspot Shield is or is not connected.